After months of filling out applications all over town, and many weekly follow-ups, we now have results! 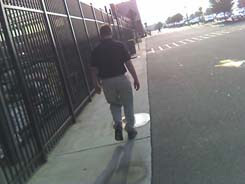 On August 30th, my good friend Justin and I attended orientation at Walmart on Summit Square Blvd. (off of University Pkwy). 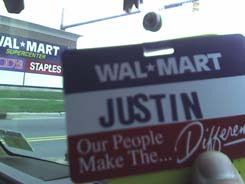 After much paperwork, videos, and well, getting 'oriented,' Justin is now officially a Walmart Cart Pusher! Now that Justin has a job he can begin saving up for his next vehicle and for his future! It's been a long ride. First we got Justin a truck, then insurance and a license. Now he's got a job! Awesome! I'm proud of what Justin has accomplished. It hasn't been easy, but he's hung in there and made it happen.